This monster appears in the artwork of Trickstar Light Stage. This card is named after the Lycoris. If your hand is revealed by the effect of "The Eye of Truth", you cannot activate the effect of a "Trickstar Lycorissica" in your hand. 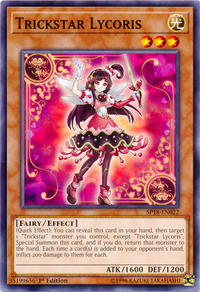 If the “Trickstar” monster targeted with the effect of "Trickstar Lycorissica" was destroyed and is no longer on the field when the effect resolves, "Trickstar Lycorissica" is still Special Summoned from your hand but the part of the effect that returns the targeted monster to your hand is not applied.